2 CYCLE 16 IN. CHAIN SAW is rated 4.7 out of 5 by 984. 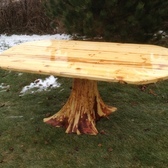 Rated 5 out of 5 by andyK47 from Easy to use/handle, started right up! We lost a large portion of one of our trees in the back yard for the second year in a row. I decided it was time to upgrade my chain saw to gas. 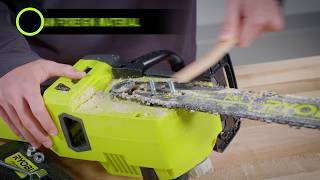 This Ryobi checked all my boxes or size, power, reliability, great reviews, reputation, and price point. The chainsaw fired right up and setup instructions were very clear. I had been using a gen 1 Ryobi 18v 12" chain saw initially that just couldn't get the job done. I had made almost no progress on the tree, but once I got this out I was done (with the cutting portion) within 20 minutes. Would recommend for anyone managing decent sized trees. Rated 5 out of 5 by tr3y003 from Great value, best case! Amazing value! We had a storm that toom down a lot of trees! Chainsaws were flying off the shelf! We needed one, i almost compromised and bought a different brand. Luckily home depot got a new stock in! I snatched it up! The case is perfect! It has space to store the bar/chain oil (1quart bottle!) and the 2 cycle oil (16oz!) 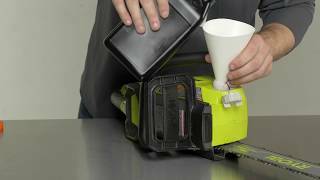 the scabbard also remove from the case to transport the chainsaw without the full case. The case is square not custom molded so its stackable with other items and not awkwardly shaped. The chainsaw itself is light but doesnt feel cheap. And it cuts through wood like butter! Following the easy steps to start from cold start it started up easy! Ive never had a problem with Ryobi products, and im positive with the proper care and maintenance this will last. Couldnt be more happy with this chainsaw! Rated 4 out of 5 by DonaldBri from Great chainsaw for the price To be honest I wasn't really expecting too much from this little saw. I guess I got caught up in the fact that its not one of those big expensive brand name saws. Right out of the box this thing has been chewing up the wood. I have used it a ton as I rely on my wood stove to heat the house. It is also pretty easy on the fuel and bar & chain oil as well. My only complaint, if I had any, would be that I have to sharpen the chain more often than I would like. Other than that this has been a great chain saw especially considering how much I paid for it. Rated 5 out of 5 by DougHbtr from Great First Saw I bought this saw on a weekend to cut a neighbor's tree into firewood lengths. I've never owned or operated a chainsaw before. I had friend's recommend much higher priced brands, but since this was an unplanned purchase, I was just looking for something that would get the job done and was affordable. This saw fit those requirements very well. I use Ryobi 18V One+ cordless tools, so was familiar with the brand, but this was my first Ryobi gas tool. 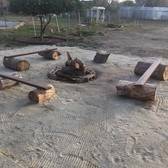 The engine started easily and reliably every time and had plenty of power to cut through the 14" diameter oak logs I was cutting. Very easy to use for a beginner. Great power. Great value. Exactly what I needed. Rated 5 out of 5 by Mikkelson from Once a Ryobi customer, always a customer Purchased this saw about 2 weeks ago. Have burned over a gallon of gas and gallon of chain oil. Have had only one issue and that was getting used to handling the tool. The chain comes of if you handle it with out firm control. After learning that and the chain coming off twice, I have had no, none, zero issues with the saw. I do keep it sharp after each tank full of gas, but that was how I was taught 50 years ago by my father. Treat with respect, and it will last a long time. I have used it just about every day since purchased and it starts easy stays running. It is only 37cc, but if you let it cut and not force it, it runs and cuts beautifully. Rated 5 out of 5 by Little Lumberjack from Powerful Chain Saw - Great Value I bought this chain saw to cut up some pieces of wood into smaller pieces for a fire. It came with a protective carrying case and a wrench to adjust the chain. It cut right through the wood and had no trouble cutting through the thick pieces. The weight isn't too heavy and the chain oil only comes out while running so you don't have to worry about it leaking. The chain did loosen up after the first day but it was easy to readjust with the supplied wrench. The end has a kickback plate to prevent the chain saw from kicking back. The protective case is great to store all of the materials. The price was great too. Rated 5 out of 5 by O Dogg from Another great Ryobi too! 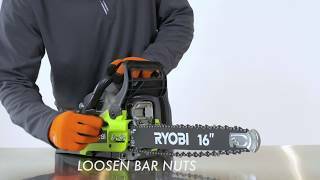 I was in need of chainsaw for firewood for camp so the first brand to come to mind was Ryobi! I have a Ryobi weed wacker, 4pc power tool set, and mulit function air pump which all are great and never let me down! This chainsaw cut thru a 12in thick tree stump like butter and kept going and going for hours. 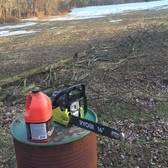 Only thing you have to do is refuel and add bar & chain oil at the same time and after awhile of straight use tighten the chain back up a little bit but that's with every chainsaw. Thanks again Ryobi for another great power tool! Next time I'm in need of a tool I will definitely look to Ryobi once again!!! 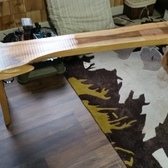 Rated 5 out of 5 by Ulfhednar from Not Disappointed I have an older saw which has been in use; first by my Dad and now me, for 40 years or more. It's a bit worn. I needed a new saw for cutting some fir logs up to split for this coming winter. I was skeptical at first, when I saw that this was one of the only saws available. It appears that Home Depot was hit hard for chainsaw demand after the start of great weather. Nevertheless, I bought this saw and couldn't be happier with it's performance. 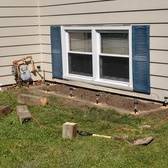 I really would rather have had a 20 inch bar but a big job was no problem for this little saw, and other Ryobi tools that I own have been very reliable. I am satisfied! 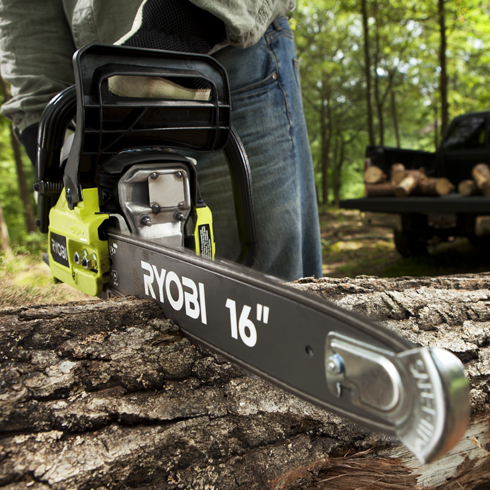 The RYOBI 2-Cycle 16" Chain Saw is the perfect saw for any homeowner. With it's powerful 37cc engine and 16" bar, this saw is built to handle the toughest jobs. The anti-vibe handle will ensure a comfortable cut from start to finish. This tool also comes equipped with an automatic oiler to help prolong the life of the chain! As with most chain saws, safety is a huge concern. That is why this unit comes with an inertia-activated chain break and a safety tip to protect against rotational kickback. 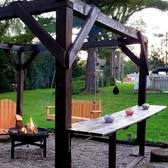 FALL OASIS- Pergola Seating for Cookouts & Campfires!